Once again BJP swept the Uttar Pradesh civic elections on Friday right before the Gujarat elections, CM Yogi Adityanath passed his first major electoral test after becoming chief minister in March. BJP won 14 out of 16 Mayor posts of the Municipal Corporations (Nagar Nigams). The Congress faced the embarrassment of losing ints bastion Amethi, the Lok Sabha constituency of its vice president Rahul Gandhi, Congress and Samajwadi Party both failed to open their account. Mayawati-led Bahujan Samaj Party (BSP) make a mini-comeback, won two out of the 16 Nagar Nigam Mayor posts giving a challenge to BJP candidates to win the mayoral posts in western UP’s Aligarh and Meerut towns. Samajwadi Party failed to win even in its Firozabad ending in the third position. BJP won most of the areas, including the newly-formed Nagar Nigams Ayodhya and Mathura, also scored impressive victories in Kanpur and Ghaziabad with a margin of over a lakh votes. 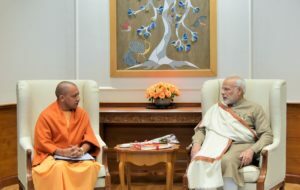 PM Narendra Modi congratulated UP Chief Minister Yogi Adityanath on the win. “The victory is significant in many ways. These results will have an impact all across the country. The propaganda of the opposition has been exposed. Traders in cities have approved the GST, “ the PM said in an address to BJP’s women workers in Gujarat on Friday. The results are boosting the BJP as they come days before the high-stakes Gujarat Assembly polls. Previous articleHave a hefty balance in your EPF? Here is what you must know about it!